Motorola's 360 was the first beautiful round Android Wear, but it's certainly not the last. LG is bringing one to the table as well, the LG G Watch R. Not to be outdone, LG's second Android Wear outing has a few fancy special features of its own: No "flat tire" on its screen and a ring of ticks etched around the outside. 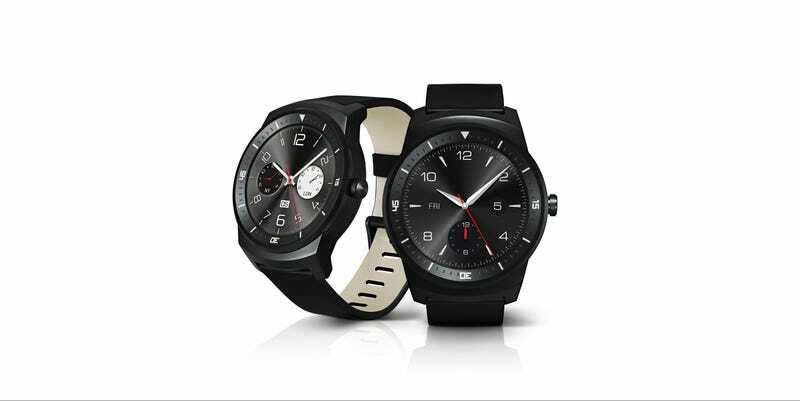 The LG G Watch R sports a 1.3-inch P-OLED display, a 1.2GHz Snapdragon 400 processor, 4GB of storage, 512MB of RAM, a best-in-class 410mAh battery (better than the G Watch and the Gear Live though we still don't know what the 360 has), a heart rate monitor, and is waterproof for up to 30 minutes in three feet of water. As for that face, you'll notice the lack of a black-spot at the bottom, like the one you can't unsee on the Moto 360—a point LG is keen to drive home, (rightfully) calling the G Watch R the first wearable to use "100 percent of its circular display." As for the tick marks around the side? Yes, those are etched in, so expect any pure digital watchface to look a little goofy. But what are you doing using a digital watchface on a beautiful round screen anyway? Besides, this is exactly this kind of hardware innovation that'll make Android Wear devices fun and different if also occasionally weird and dumb. The G Watch R will be available later this year with price announced at launch.